Phu Quoc Island in southwest Vietnam has seen a 60% surge in seat capacity since the opening of a new airport in Dec-2012. More growth is expected over the medium-term as Phu Quoc, which Vietnam is keen to develop into a major tourism destination, looks to attract international services. For now Phu Quoc handles domestic services from three carriers, including Vietjet, which became the first LCC to serve the market on 15-Dec-2012. Phu Quoc’s new airport is designated for international services and can handle widebody aircraft, replacing an older facility which could only accommodate regional aircraft. If it succeeds in attracting international services, Phu Quoc would become Vietnam’s fourth airport with international services. It has already grown to become the country’s seventh largest domestic airport, jumping two places over the last month, and could become the fourth largest domestic airport if capacity grows by just another 20%. Flights from the Phu Quoc’s old airport, which was served by Vietnam Airlines ATR-72s and Air Mekong Bombardier CRJ900s, moved over to the new facility on 01-Dec-2012. The formal opening of Phu Quoc International Airport took place on 15-Dec with a ceremony attended by Vietnamese Prime Minister Nguyen Tan Dung. To coincide with the airport’s official opening, VietJet launched a daily flight to Phu Quoc from Ho Chi Minh with 180-seat A320s and Vietnam Airlines launched five weekly flights from Hanoi to Phu Quoc using 184-seat A321s. Vietnam Airlines previously only served Phu Quoc from Ho Chi Minh. The flag carrier continues to serve the Ho Chi Minh-Phu Quoc route with seven frequencies on most days, according to Innovata data. It also operates from Phu Quoc a daily flight to Can Tho and four weekly frequencies to Rach Gia (both are destinations in southern Vietnam which are closer to Phu Quoc than Ho Chi Minh). Since the new airport opened Vietnam Airlines has upgraded two of its Ho Chi Minh-Phu Quoc daily frequencies to A321s. The carrier will likely up-gauge more of its ATR-72 flights on the route to A320 family aircraft as it the only turboprop operator in the market. 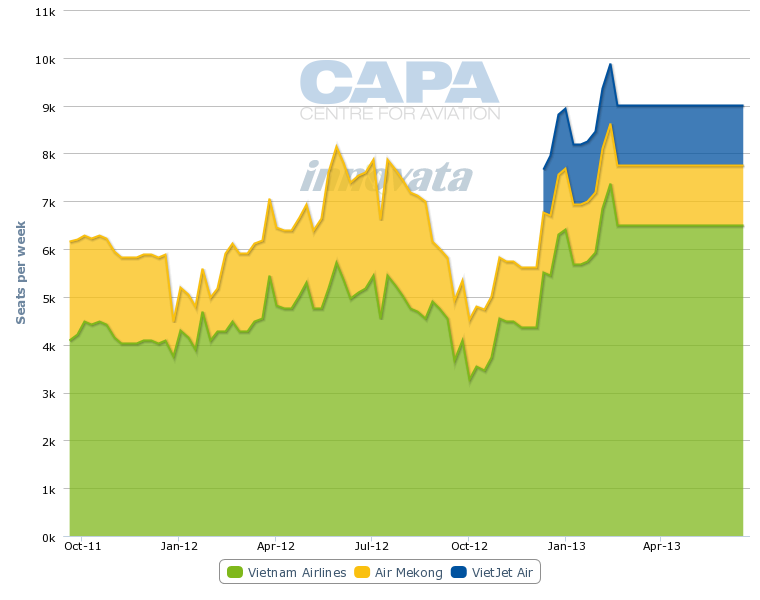 Vietnam Airlines remains the market leader at Phu Quoc, accounting currently for 72% of total seat capacity. 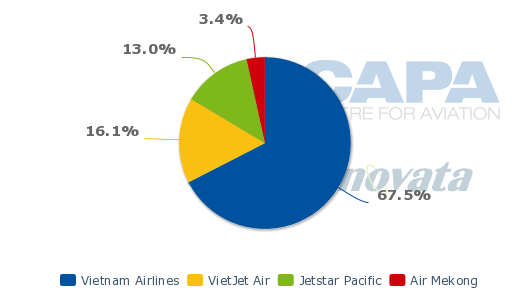 This is roughly in line with the carrier’s 68% share of total capacity in the Vietnamese domestic market. Air Mekong is the only carrier that did not increase capacity at Phu Quoc in the new airport’s first month of operations, according to Innovata data. As a result, Air Mekong has seen its capacity share at Phu Quoc drop from 22% at the end of Nov-2012 to 14% at the end of Dec-2012 as total seat capacity at the airport has increased by just over 60% from about 11,200 to about 18,000. VietJet could surpass Air Mekong and become the second largest carrier at Phu Quoc if the LCC decides to add a second frequency on the Ho Chi Min-Phu Quoc route or launch flights on the longer Hanoi-Phu Quoc route. While a potential boom for VietJet and Vietnam Airlines, the opening of Phu Quoc’s new airport will likely have a negative impact over the medium to long-term on Air Mekong. Phu Quoc has been an important niche market for Air Mekong since the regional carrier launched services in Oct-2010. Air Mekong’s fleet of CRJ900s, a regional jet with short-field takeoff performance that previously was not operating in Vietnam, enabled the carrier to carve out a niche as the only jet operator at Phu Quoc. The carrier was essentially protected from competition with LCCs in its biggest market as the island’s former airport could not accommodate narrowbody aircraft such as A320s. In addition to being the only jet operator on the busy Ho Chi Minh-Phu Quoc route for over two years, Air Mekong was the only carrier for over 18 months offering non-stop services between Hanoi and Phu Quoc, a route other Vietnamese carriers could not offer as it was too long for turboprops. Air Mekong reduced capacity to Phu Quoc in the months leading up to the opening of the new airport. At the end of Aug-2012, Air Mekong cut in half its capacity at Phu Quoc, reducing frequencies on the Ho Chi Minh and Hanoi routes. But Ho Chi Minh-Phu Quoc is still the carrier’s largest route and accounts for about 20% of Air Mekong’s total capacity, according to Innovata data. While Air Mekong’s main operating base is Ho Chi Minh and its largest office is in Hanoi, the carrier’s headquarters are at Phu Quoc and it is majority owned by a large travel company with properties on Phu Quoc. US regional airline group SkyWest also owns a minority stake. In Aug-2012 Air Mekong unveiled plans to add A320 family aircraft as part of a new strategy that envisioned the carrier entering trunk routes such as Ho Chi Minh-Da Nang and dropping its previous niche or boutique carrier model. But the first batch of two A321s, which were initially expected to be placed into service in Dec-2012 in time for the opening of the new airport at Phu Quoc, has not yet arrived. 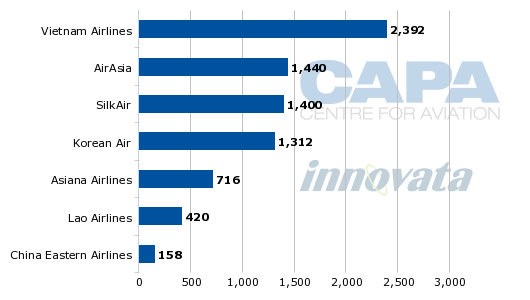 It is unclear if Air Mekong still plans to transition to larger aircraft as the carrier’s schedule through Feb-2013, as published on its website, only lists CRJ900 flights. Air Mekong faces an uphill battle competing against a strong privately-owned LCC and government-owned flag carrier. VietJet’s recent domestic expansion also saw the carrier enter Dalat, another relatively small leisure-focused destination not previously served by a LCC. VietJet is now operating one daily flight between Hanoi and Dalat in competition with Air Mekong and Vietnam Airlines. Overall Air Mekong has just a 3% share of capacity in Vietnam’s domestic market, according to Innovata data. Even if Air Mekong eventually succeeds at securing narrowbody aircraft, it could struggle to compete against two LCCs and a strong flag carrier in Vietnam Airlines. It is unclear if Air Mekong will downsize or close its regional operation if and when it takes A320s. Switching to A320s could be a logical move, particularly for the Phu Quoc market where the planned Dec-2012 opening of a new airport paves the way for VietJet’s launch of Phu Quoc services. The new airport will also enable Vietnam Airlines to up-gauge its Phu Quoc flights from ATR 72s to A320s and allow Jetstar Pacific to enter the market. Phu Quoc is a natural market for LCCs as it is a leisure market in which inbound demand can be stimulated significantly by lowering fares. Phu Quoc until now has been predominately a domestic holiday destination. The island has huge potential for rapid growth in domestic inbound traffic, particularly as Vietnam’s middle class expands, as well as international inbound traffic. The new airport is a major component of a plan to develop Phu Quoc into a major tourism destination. Vietnam is aiming to attract foreign carriers and has the ambition to develop Phu Quoc into the Phuket of Vietnam. Phu Quoc airport officials have reportedly received interest from foreign carriers from Europe, Russia, South Korea as well as other countries in Southeast Asia. Airport officials also have said that Vietnam Airlines, VietJet and Air Mekong are considering international routes from Phu Quoc. VietJet is expanding into the international market in Feb-2013 with the launch of flights from Ho Chi Minh to Bangkok. The carrier plans to add several more international routes in 2013 but is expected to focus initially on routes from Ho Chi Minh and potentially Hanoi. As VietJet does not have a strong brand outside Vietnam it is unlikely the carrier at this stage would look to launch international services to an inbound-focused market such as Phu Quoc. Vietnam Airlines is also focused on building up international operations at its Ho Chi Minh and Hanoi hubs. But as the carrier is government owned it could be persuaded to consider international flights from Phu Quoc. Air Mekong, given its Phu Quoc roots, is more likely to become the first international carrier at Phu Quoc. The carrier is looking to open niche routes that connect Phu Quoc with other popular tourist destinations in Southeast Asia such as Siem Reap and Luang Prabang. Such routes would follow the model used by Bangkok Airways, which Air Mekong has spoken to about potential partnerships. But Phu Quoc as a destination may not be mature enough to support such niche routes given the island is still relatively undeveloped and is not well known outside Vietnam. Infrastructure is particularly a problem as Phu Quoc lacks paved roads and has a limited number of five star hotel rooms. An airport alone is not enough to bring in international tourists, a lesson which has been learned in nearby Cambodia, where the Sihanoukville Airport only has limited domestic services six years after opening. Like Phu Quoc, Sihanoukville is an up and coming beach destination but lacks basic infrastructure including roads and has a limited number of hotel rooms. Sihanoukville is now competing with Phu Quoc – the two are only about 50km apart as Phu Quoc is located at the Vietnam-Cambodia boarder – for “next Phuket” status. Both destinations, and airports, face challenges as they look to compete with the more developed and well known resort destinations in nearby Thailand. At the Phu Quoc International Airport opening ceremony on 15-Dec-2012, Prime Minister Dung promised the island’s infrastructure would be upgraded including new roads and a power system which will connect Phu Quoc to the national grid. Phu Quoc will likely need to complete a major infrastructure upgrade before it can attract foreign carriers. Once the infrastructure is in place, LCCs from other Asian countries could particularly be enticed to launch services to the island if the right incentive package is offered. AirAsia is the most logical candidate. AirAsia is by far the largest international LCC brand in Vietnam, accounting for about 50% of total international LCC capacity to and from the country. AirAsia already serves Vietnam’s three largest airports – Ho Chi Minh, Hanoi and Da Nang – and could potentially serve Phu Quoc from both its Kuala Lumpur and Bangkok hubs. Services from full-service regional subsidiaries of major Southeast Asian airline groups, such SilkAir of the Singapore Airlines Group or Thai Smile from the Thai Airways Group, could also be an option. Charters from Europe and Russia are another possibility as they would be lower risk than scheduled services. The new airport’s runway is 3,000m long and has been built to handle aircraft as large as 747s and A380s. The terminal is 24,000m2 and has capacity for 2.6 million annual passengers. Phu Quoc, which now has only about 600,000 annual visitors, expects its new airport to reach the 2.6 million figure by 2020. The airport has plenty of space for terminal expansion, which will likely be needed next decade as annual passenger traffic is projected to eventually reach seven million. The airport was developed by Vietnam’s Southern Airports Corporation, which in 2012 merged with the Northern Airports Corporation and the Middle Airports Corporation to create the new Airports Corporation of Vietnam (ACP). Southern Airports reportedly invested over VND3 trillion (USD144 million) into the project, which took four years to complete. Southern Airports paid for the project primarily using profits from its main airport in Ho Chi Minh City. While Vietnam has opened several new airports in recent years, including an airport at Sao Vang in Dec-2012, all the other projects have involved domestic airports. Vietnam however has invested in upgrading its existing international airports, including opening a new international terminal at Da Nang in central Vietnam in Dec-2011. Currently only three airports in Vietnam have internationals services – Ho Chi Minh, Hanoi and Da Nang. Before its new international terminal opened, Da Nang had accommodated international services using an ageing combined international-domestic terminal. But the airport has seen its international passenger numbers increase significantly since the new terminal was opened and the Vietnamese government expects to see a continued rise in international traffic at Da Nang as central Vietnam grows into a major tourism destination. AirAsia, Asiana, Korean Air, China Eastern/Shanghai Airlines and Lao Airlines have all launched services to Da Nang since Dec-2011. Vietnam Airlines also launched international services from Da Nang in 2012, with services to Beijing, Guangzhou and Hangzhou. For several years SilkAir was the only international carrier at Da Nang although a few other foreign carriers such as Bangkok Airways were in and out of the market. There are several large scale beach resorts now being developed just south of Da Nang. Da Nang is also the gateway to the tourist town of Hoi An. It is also only about 80km from the imperial city of Hue, which has its own airport but is limited to domestic services. Hue is the fifth largest domestic airport in Vietnam, with slightly more capacity than Phu Quoc (see background information). Phu Quoc is now hoping to match the recent success of Da Nang Airport. As Vietnam continues to emerge as a major tourist destination, there will be sufficient demand to support multiple gateways. Increasing congestion in Ho Chi Minh, where a new airport is planned but is not expected to open until about 2020, and Hanoi will also provide opportunities for airports such as Da Nang and Phu Quoc. While Vietnam’s major carriers will likely continue to focus on building up their bases at Vietnam’s two largest cities, foreign carriers will be keen to expand their Vietnam networks to the country’s newest international facilities.